COLUMNIST WITH THE Irish Times Una Mullally has been a prominent voice for the Yes vote in the upcoming marriage referendum. I guess it’s hard to accept yourself when your country doesn’t. Today she posted a letter she received from a reader claiming her cancer was “the will of God”. 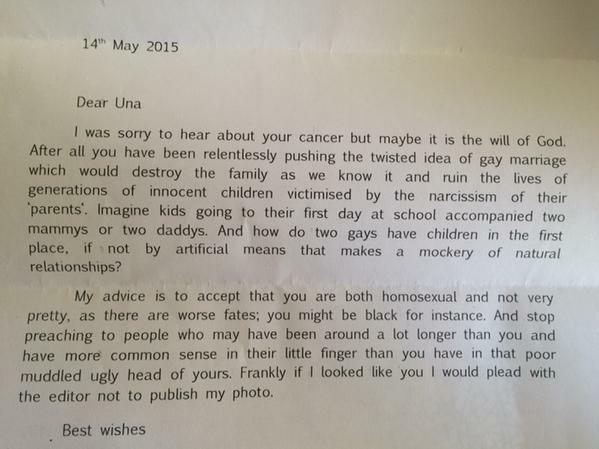 The letter went on to say that she should accept that she is homosexual and that “not very pretty”. Oh, it just gets worse. Mullally said it isn’t the worst she’s received. That's not even the worst letter I've received - there's other stuff I wouldn't even put on Twitter because it's so disgusting. I don't give a damn if some bigot hates me, but next time a No campaigner talks about being "bullied", this is what I'm putting up with. Twitter was quick to jump to her defence. @UnaMullally I didn't think this level existed. Deeply saddened & shocked by this. Sorry you've to deal with this Una. Mind yourself. Written by Nicola Byrne and originally published on DailyEdge.ie. Email “'Sorry to hear about your cancer, but maybe it's the will of God'”. Feedback on “'Sorry to hear about your cancer, but maybe it's the will of God'”.